How to start a bar fight? The Getaway live on the App Store! Bar Fight Live on the App Store! 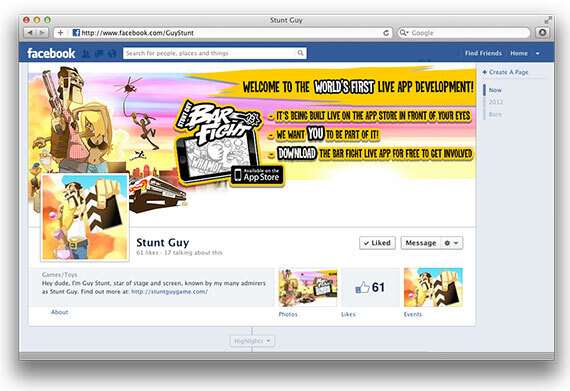 "Hey dudes, I'm Guy Stunt, star of stage and screen, known by my many admirers as Stunt Guy. You'll have seen much of my work but you might not realise it was me as I'm generally taking the place of some wussy, flouncy actor-type who doesn't have the stones to do the scene. Remember when Keanu beat off all those dudes in black suits? That was me. When Sly sewed himself up? Me again. When Sharron un-crossed her legs? Yeah... you guessed it. Anyway, a few months back some weedy dudes from ingerland gave me a call and offered me a truck-load of cash to star in two of their games. I pointed out that they didn’t have any scars and so they threw in a white-tiger which sealed the deal. Apparently these two games will be “free apps on iOS” (whatever that means) and will be released in the middle of July. The bit I really don’t get is that they haven’t actually built the second one and they’re planning to sell it to you as they build it so you can see it as it develops – they reckon you’ll like that. Personally I can’t see why anyone would play either game when there’s still good gator-wrestlin’ to be done."